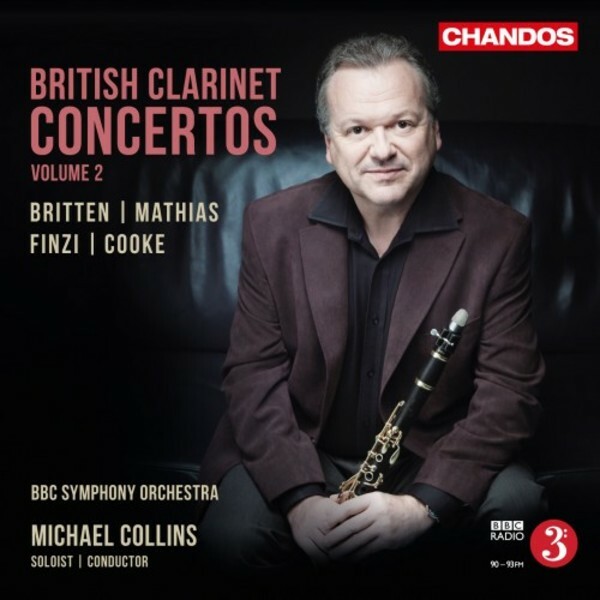 This second volume of British Clarinet Concertos follows ‘a stunning recording’ made a Critic’s Choice of the Year in Gramophone (2013). Here again, the exclusive Chandos artist Michael Collins combines the role of soloist with that of conductor of the BBC Symphony Orchestra. The two three-movement concertos included in this album are fine examples of their respective composers’ work. While Arnold Cooke’s Concerto makes the most of the solo instrument’s wide-ranging lyricism, the Concerto with strings and percussion by William Mathias is a virtuoso piece for the instrument, which exploits its capacity for fluent runs and incisive attacks and its affinities with jazz. The programme is completed by two arrangements, though of different kinds. Benjamin Britten’s Movements for a Clarinet Concerto is the surviving sketch for the opening movement of a concerto which Britten started writing in 1941 for the great American jazz clarinettist Benny Goodman. Gerald Finzi’s Five Bagatelles is a set of short pieces written as a companion piece to Finzi’s well-known Clarinet Concerto - featured on volume 1 [CHAN10739].